During our latest Morning Session on Customer Engagement in B2B marketing, we had the pleasure to introduce an award-winning client, Inmarsat Aviation. Inmarsat is the leading provider of satellite communications solutions to airlines, operators, and passengers worldwide. Due to the services provided by Inmarsat, you are now able to be connected at 35,000 feet in the sky. Inmarsat Aviation and Ogilvy in London have developed and executed an exciting and efficient Customer Engagement programme. The case was presented by Dominic Walters, Vice President Marketing Communications & Strategy at Inmarsat Aviation and Nik Myers, Planning Partner, Ogilvy London. We asked Dominic Walters, Vice President Marketing Communications & Strategy at Inmarsat Aviation, what was crucial to know in B2B Customer Engagement? Inmarsat Aviation – Bring it on! We were brought on a journey of customer engagement at the morning session at Ogilvy Denmark. Over the last five years, Inmarsat Aviation has been working on how to build a strong brand in an industry which is undergoing a digital transformation. With help from Ogilvy, Inmarsat Aviation managed to disrupt the status quo and enlighten its target audience. In the first six months alone, a targeted digital and experiential activity engaged 60% of target market accounts. Thought leadership content and partnerships, combined with high-touch media relations management, put Inmarsat’s name firmly at the center of the industry conversation. Brand awareness jumped to 67% within the industry – placing Inmarsat Aviation jointly alongside the leading competitor. We asked Nik Myers, Planning Partner, Ogilvy London, to give his take on what’s is trending in B2B Customer engagement? If you want to know more about the Award-winning case on Inmarsat Aviation, please feel free to reach out to us or sign up to our newsletter for more information on future events. For the first time ever, Ogilvy and IBM join forces to create a special session for Scandinavian marketeers like you in B2B industries. Digital initiatives within pharma and medtech are often driven by high ambition and large investment. Problem is, they rarely live up to their full potential. Digital tools tend to be launched as one-off add-ons not anchored in a wider business strategy. Today however, more and more companies are recognising the importance of integrating digital into the core of their business. 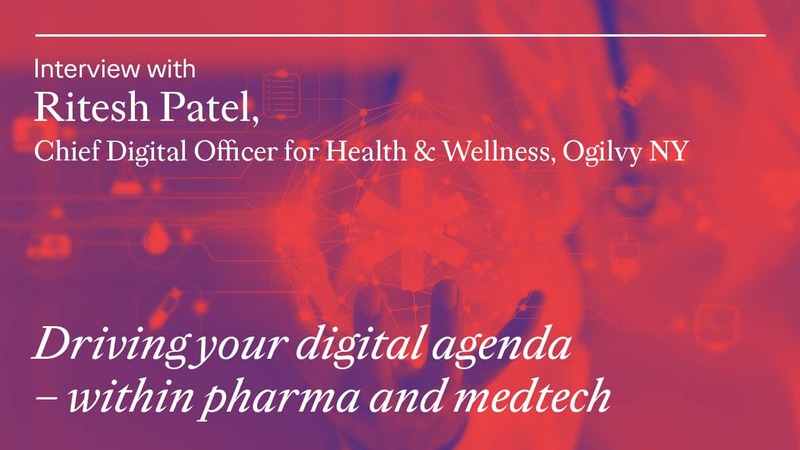 This interview with Ogilvy NY’s Ritesh Patel was recorded june 2018. If you want to be updated on original work, overwhelming insights, outstanding tech, overlooked brands, or just want a great opportunity to follow our thoughts – you should sign up below. Ogilvy og Sociuu inviterede fredag den 23. juni til event om medarbejderambassadørskab. Vi lagde ud med en gennemgang af, hvorfor medarbejdere burde spille en langt mere central rolle i virksomhedens kommunikationsstrategi, end de gør i dag. For eksempel er content fra medarbejdere hele otte gange mere troværdigt end content fra virksomheden selv. Vi så på forskellige muligheder for at bruge medarbejdere som ambassadører, og på hvilke niveauer medarbejderne kan aktiveres, lige fra dele-ambassadøren til den officielle brand-ambassadør. Derefter tog Michael Fælling Sørensen fra Sociuu over og fortalte om, hvordan man nemt og gnidningsfrit kan komme i gang med at aktivere sine medarbejdere gennem den rette software. Publikum fik også imponerende tal fra det virkelige liv på, hvor meget medarbejderene kan spare på virksomhedens mediebudget. Tak til de mere end 50 gæster, der mødte op og stillede nysgerrige spørgsmål på dagen. – Skal Carsten virkelig være brandambassadør? – Kære CEO, har du noget på hjertet?